Guess which Presidential candidate wants to be the champion of the working class? It’s understandable if you answered “Sen. Bernie Sanders,” since the democratic socialist candidate strongly favors, among other strategies to help working families, strengthening labor unions, reducing inequality, regulating banks and providing single-payer universal health insurance and free public university education. Having plummeted in the presidential primary polls, Walker needs to figure out a way to stand out in the pack, and he has apparently decided that running hard against labor unions and their “bosses” can endear him to many blue-collar voters as well as such billionaire backers as the Koch brothers. Recently—especially in a Las Vegas speech on Monday—Walker has returned to his right-wing glory days of the winter of 2011-2012, when he led his Republican legislative majority to curb public employee unions despite massive protests. On Monday, he unveiled a new plan for his presidency that, he says, “will eliminate the big government unions entirely and put the American people back in charge of their government.” If elected, he promised, “On Day One, I will repeal all of President Obama’s regulations that have reduced employee freedom”—that is, freedom from the right to have a union—“and that have made it harder to create jobs” (though his intention is to get rid of many public sector jobs without offering any evidence that will stimulate private sector job growth). Walker says that his plan would “get rid of” the National Labor Relations Board (NLRB), shifting its responsibilities to mediators and the courts, which are ill-equipped to deal with the investigation and settlement of disputes surrounding implementation of the National Labor Relations Act, such as fulfilling its primary purpose: to encourage collective bargaining. But he clearly doesn’t believe that those hard-working people have any rights on the job (except to reject unions), especially when they work for the government. “Collective bargaining is not a right, it is an expensive entitlement,” he says, linking collective bargaining to anti-welfare sentiments by calling it an “entitlement,” one of the vilest epithets in the right-wing lexicon. Walker extols the freedom of every worker—“every state or local worker and every private sector worker has the freedom to choose whether they want to be in a labor union or not.” But he proposes wiping out all public sector unions and supports Republican legislation—the Employee Rights Act—that would make it much more difficult for workers to choose freely to be in a labor union. Walker’s renewed anti-labor gambit goes against the political grain, since polling shows a rise in public approval of unions, and even among blue-collar conservatives whom Walker clearly hopes to win over, it is not likely that large numbers see unions as as much of a burden as Walker and his billionaire backers do. 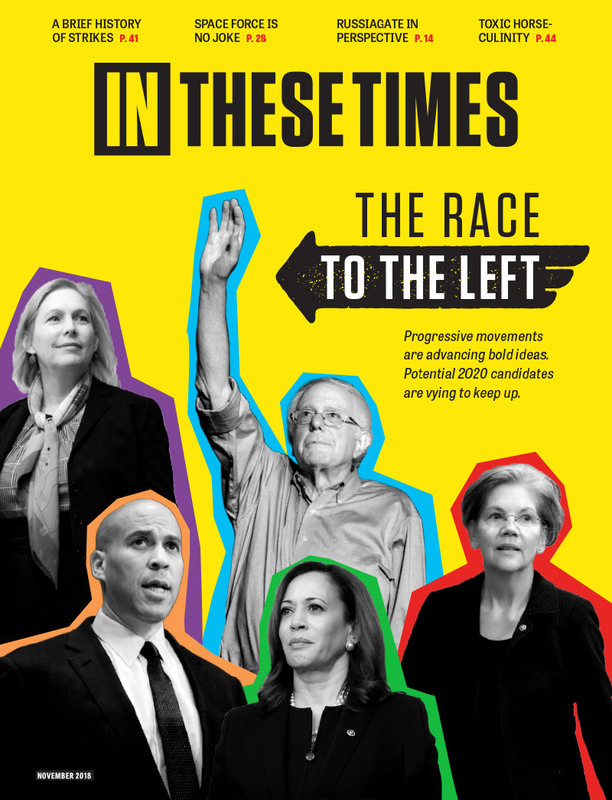 Even if this gambit does not win him the nomination, or even keep him in the race for long, it illustrates some of the potential of a tortured class struggle politics from the Right, whose destructive potential should not be underestimated. It's clear that you hate workers and love quitters. Again, your deep "union thug" contempt for working people contributes to why unions are less and less popular. Thing is, you are on the losing side. Workers are on the union side. Due to strong popular support for reforms like right-to-work, legislators are intervening to tip the balance of power from union bosses to workers. Taxpayers are also fed up with awful union teachers making $100,000 a year and not bothering to teach children how to read. And this is one post where you DEFEND union thugs being too lazy to do the job. This might be fun for you if it is someone like Walker whom you hate because he defends workers' rights. But will you sing the same tune when sloppy union thug is too lazy to bury you? And... "Even with the tacit blessing of the local unions lead steward"
You don't need to answer to him. In fact, he is your enemy. Stealing hundreds each year from you and other workers in order to pay for political campaigns. "you can get a lot of work done without having to kill yourself doing it"
Thanks to feather bedding, some union thugs don't even show up the whole weak. Unions mean low quality work. They force companies to close entire plants. Then you are lazy to not bother to work. and very arrogant to insult the actual workers who cross picket lines. "Union workers may look "Lazy" to you"
1) I am not referring to workers. I am referring to the quitters on the picket line. 2) "Lazy" is a fair description: waving signs and beating people up is a lot easier than doing an honest day's work. I couldn't do it. Even with the tacit blessing of the local unions lead steward, and on the verge of being homeless, I couldn't cross a picket line to work. No they don't. Those who cross the picket lines are hard working people who are brave to risk the assault and juvenile name-calling of those on the picket line who are too lazy to work. Thief has a definition. Working at a job someone threw away does not meet it. You are an anti-worker extremist: hating working people, and calling them silly names. I most emphatically do NOT call all non-union workers "Scabs" but those who cross a picket line certainly meet the definition, and I stand by calling them what they are. THIEVES stealing other people's jobs. "Scabs are part of the healing process"
Anyway, you are using insulting playground language. I will call them what they are: real workers. They steal nothing. They earn their pay. The certainly do not steal another man's job: in this situation, the other man has QUIT and THROWN AWAY his job. If it were this "other man's" job., the other man would not have walked off from it. It's complete "BS" to say a striker is fighting to make things better for ALL families. So often, when unions win, it forces the company to close the entire plant. And how does everyone being fired help "all families"? Look at Detroit. If anything, those you call "scabs" help all families. by not being lazy and actually WORKING, and making it a lot less likely that the plant will close. It's crazy situations like unions insulting hard working people who earn a wage without a union as "Scabs" that have made unions so unpopular: with a strong majority supporting right-to-work and only half thinking unions should even exist at all. "Scab" = insult used by non-workers against hard working people. Anyway, your comment implies that union "workers" are unprofessional and too lazy to do the job. That is my experience also. "WAR BASED ON LIES - - George "W"MD's Bush..."
The only lies are yours. Many WMD were found. Scott Walker hasn't engaged in any union busting yet. His reforms have protected the rights of workers to choose to join unions, as well as not join them. Scott Walkeris praying for another bail-out ( like the recall) to re-energize his dead campaign. If you look at the flawed republican lineup - they have started telling the truth about each other. T R U T H - - J U S T I C E - - -no truth - no justice - largest prison population in the world - - -hail - - hail - - the gangs all here - ARE YOU SOFT ON DEFRENCE ( try to get ANY accounting)..